Washington, D.C. – Today, the Center for Union Facts (CUF) is running a full-page ad in the National Journal Daily supporting the Employee Rights Act (ERA), pro-employee legislation that increases employee protections against labor union abuses. Introduced into their respective chambers by Sen. Orrin Hatch (R-Ut.) and Rep. Tom Price (R-Ga.), the ERA has 27 Senate co-sponsors – including Sen. Mitch McConnell (R-Ky.) and Sen. Lamar Alexander (R-Tn. 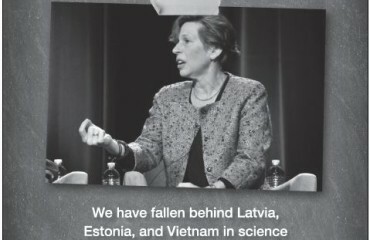 ), ranking member of the Committee on Health, Education, Labor, & Pensions – and 80 co-sponsors in the House. 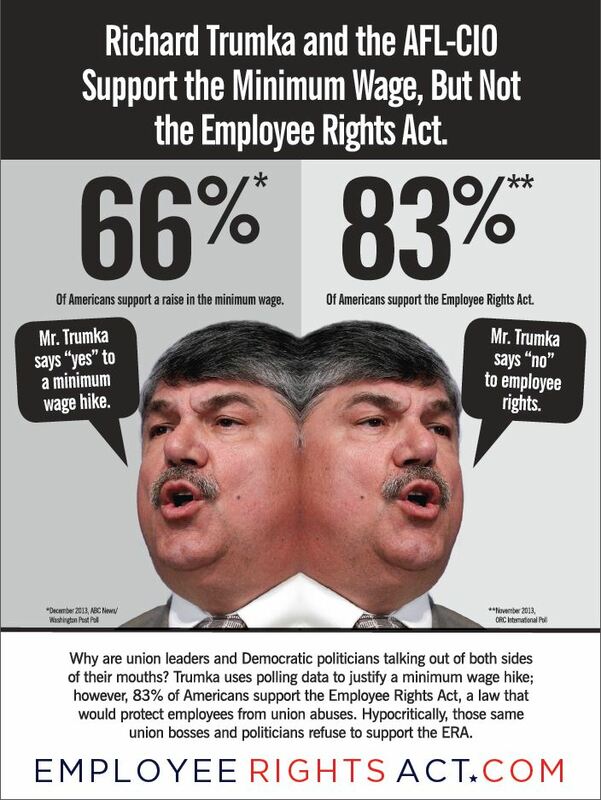 The ad illustrates the hypocrisy of organized labor in supporting a minimum wage increase but not the ERA. 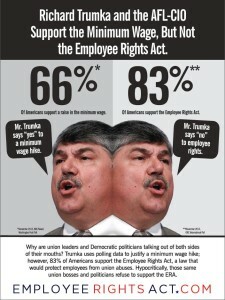 Its headline reads, “Richard Trumka and the AFL-CIO support the minimum wage, but not the Employee Rights Act,” then cites recent polling data showing that while 66 of Americans support a raise in the minimum wage, a full 83 percent support the ERA. The ERA is composed of eight straightforward principles, including such basic democratic principles as the right to secret ballot voting in unionization elections and requiring that unions receive the express consent of their members before spending union dues on political activities, aka, paycheck protection. More information on the ERA is available online at EmployeeRightsAct.com. To schedule an interview, or to comment on this release, please contact Banks Woodruff at [email protected] or (202) 463-7106. The Center for Union Facts is a non-profit organization supported by foundations, businesses, union members, and the general public. 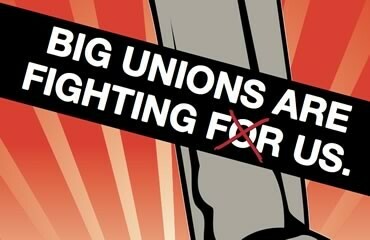 We are dedicated to showing Americans the facts about today’s union leadership.